GL’s PacketCheck™ is enhanced with stacked VLAN, MPLS and also with a capability to provide XML reports. It’s a complete PC based Ethernet / IP test tool with BERT, Throughput, Delay, and Impairment testing functions. 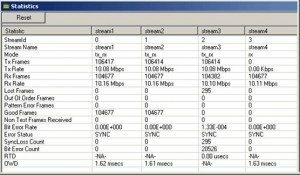 It is very easy to use as a general-purpose network performance analysis tool for 10Mbps, 100Mbps and 1Gbps LANs and WANs. Throughput up to 800 Mbps can be easily tested. PacketCheck™ truly takes confusion out of Ethernet testing at all protocol layers – from raw Ethernet frames to IP, UDP, VLAN, and MPLS packets. It makes use of PC’s network interface card (NIC) to transmit and receive Ethernet or IP packets over the network. The application can generate multi-stream Ethernet, IP, or UDP traffic with on-demand bandwidth (up to 800 Mbps). PacketCheck™ also measures end-to-end performance such as Bit Error Rate, Total Packets, Packet Loss, Out of Sequence Packets, and Error Packets. Additional features include transmission of pre-recorded file traffic, Bursty and Fixed IFG (Inter Frame Gap) traffic generation modes, delay measurements including One Way Delay – [within the same PC] and Round Trip Delay, impairment generation, and BER testing capability with provision to generate PRBS patterns or user-defined test patterns. PacketCheck™ supports features like transmission of pre-recorded file traffic, which can duplicate packet traffic as it occurred at a particular Ethernet interface. It also includes a Command Line Interface (CLI) to support all the GUI functionalities of PacketCheck™ through simple commands, allowing easy scripting and automation of testing. Also included is a powerful Report Generation feature to view report in XML and PDF formats. PacketCheck™ can operate on any of the layers – Layer 1 (Physical), Layer 2 (Data Link), Stacked VLAN (Q-in-Q), Layer 2.5 (Stacked MPLS), Layer 3 (Network), and Layer 4 (Transport – IP/UDP) of the OSI reference model. One-Way Delay – [within the same PC] is defined as the time a packet takes to travel from source to destination. PacketCheck™ determines One-way Delay – [within the same PC] measurements between two NIC cards on a single PC with 2 instances of PacketCheck™ running, one on each NIC card in microsecond accuracy. VLAN allows different hosts to be a part of the same virtual LAN irrespective of their physical location. A group of hosts connected to the same switch can be partitioned into several VLANs, or a group of hosts connected to different switches can be combined into a single VLAN. VLAN technology is used in Carrier Ethernet networks, where a common transport network carries traffic of different customer VLANs by utilizing the concept of stacked VLANs. PacketCheck™ supports customizable VLAN stacks up to 3 levels with user configurable VLAN Type, ID, and Priority. VLAN Type Field: a 16-bit field indicating a newly inserted VLAN header’s EtherType. The usual and widely recognized value for this is 0x8100. User can select from 5 different values – 0x8100, 0x88A8, 0x9100, 0x9200, 0x9300. Stacked MPLS PacketCheck™ supports stacked MPLS layers up to 3 levels, customizable with headers like Label, CoS, TTL. True Bit Error Rate Testing (BERT) on layer 1, layer 2, layer 2.5, layer 3, and layer 4 with various measurements – Bit Error Rate, Sync Loss Count, Bit Error Count, and more have been introduced. 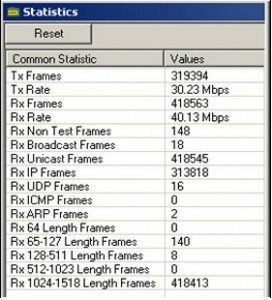 PacketCheck™ calculates Bit Error Rate for the PRBS pattern being received. ARP Packets Capability to generate/respond to ARP requests making it easy to work with Routers. ARP packets are sent to determine the MAC address of the destination. Common Statistics The application now supports Common Statistics and these are stream independent at the NIC card level. These statistics are gathered before stream level statistics processing and these statistics helps user to check if the NIC card is receiving any traffic, and if receiving, if it is non-test traffic i.e. traffic not belonging to any of the configured streams. Report Generation Report generation feature now supports both XML and PDF formats. Reports include information such as the Statistics, Configuration Information, NIC card details, Stream Statistics, Common Statistics, VLAN, MPLS, etc with customizable headers and footers. Users can include their comments and logo in the report. Users can also generate a periodic report for the selected stream while the test is running (in XML format). Users can specify the periodicity of the report per stream. 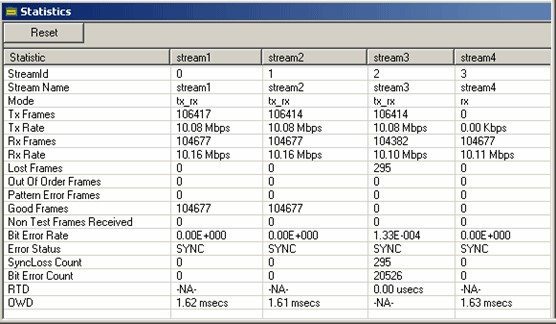 Stream Specific and Common Statistics This feature provide per stream measurement of throughput, round trip delay (RTD), one way delay (OWD)- [within the same PC], total packets, packet loss, out of sequence frames, error frames, correct pattern frames, pattern sync status, bit error rate, sync loss count, error count etc. Common statistics allow monitoring receiving traffic on the NIC by aggregating the measurements on all streams on the NIC. This is mainly helps user to know if any extra traffic is being received on the NIC. Bit Error Rate and Performance Statistics Measures Bit Error Rate at all layers – Layer1/2/3/4. Also, measures packet performance statistics like Throughput, Packet Loss, Out of order frames, One Way Delay – [within the same PC] and Round Trip Delay. PacketCheck™ can transmit HDL file traffic. An HDL file is GL’s Ethernet traffic capture format. In the Inter Frame Gap (IFG) mode, the emphasis is on maintaining the IFG between successive packet transmissions. User can configure the IFG value. In the bust mode where traffic generated was bursty and the emphasis was on maintenance of the configured bandwidth. Provide the capability to generate various run-time impairments like Insert/Delete Bytes and Byte Level Impairments (AND, OR, XOR). PacketCheck™ Command Line Interface All the functionalities of PacketCheck™ can be accessed via commands, exclusive of the GUI.